NSTC winner Junior Hanley is joined in victory lane by Hugh and Jodi Deery. Rockford, Ill. (September 20, 1981) – He came, he saw, he conquered. 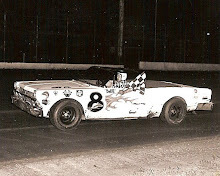 That was the story of Junior Hanley, a top driver in the history of Canadian short track racing, as he paid his first visit to the Rockford Speedway quarter-mile oval to compete in the 16th annual National Short Track Championships. 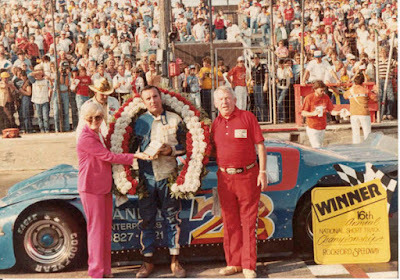 Hanley led the second half of the 200-lap race, taking the top spot from another fellow Canadian, Randy Slack of York, Ontario, Canada. Slack left the track with a split cylinder wall just as the yellow flag came out for the 101st lap mandatory pit stop. Hanley never relinquished the lead once he got out in front, but the win was anything but easy. A very determined Joe Shear of Twin Lakes, Wis., moved into second place when Hanley inherited the lead. 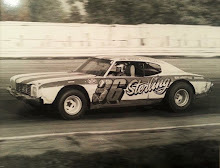 But there were a large number of lapped cars separating the two top-notch stock car pilots and it was 30 laps later before Shear could ease his dark red Camaro through the heavy traffic and stick the front end of his car under the large rear spoiler of Hanley’s dark blue Camaro. And that was exactly how they ran for the next 70 circuits. Time and time again Shear would look for an opening, wait for Hanley to make a mistake that just wouldn’t come. And it still didn’t come when the checkers waved to end the 200-lap classic. It had to be a disappointing afternoon for Shear. On two different occasions Shear found himself running second only to be involved in a mishap that would have him restarting at the tail of the field. On lap 27, a pile-up involving Shear, Steve Murgic of Burnsville, Minn., Fran Prestay of Silver Lake, Wis., and 1980 champion Jim Sauter of Necedah, Wis., sent Shear to the pit area and then back out to the rear of the grid. The accident retired Sauter for the afternoon. By lap 75, Joe had worked his way back up to the number two slot, but on lap 89 disaster struck again. Shear and Jim Pierson of Beloit, Wis., got together on the frontstretch, sending shear back to the pits again, this time for a new tire. Once again, Shear would tag on to the back of the pack while Pierson would be done for the day. 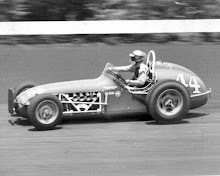 Dave Watson of Milton, Wis., would lead the first to laps of the race until Fred Campbell of Battle Creek, Mich., took the lead. Campbell would lead until lap 18 when Slack took over. Campbell would soon retire with electrical issues while Slack led until the halfway mark, retiring with engine woes. 1. Junior Hanley, Oakville, Ontario, Canada. 2. Joe Shear, Twin Lakes, Wis.
3. Steve Moll, Wisconsin Rapids, Wis.
4. Larry Middleton, East Hazelcrest, Ill.
5. Tony Hertko, Channahon, Ill.
6. 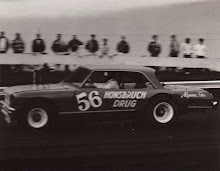 Mel Whalen, Shakopee, Minn.
7. Doug Lane, Watervliet, Minn.
8. Bill Berkheimer, Roscoe, Ill.
9. Wayne Lensing, Rockford, Ill.
10. Steve Murgic, Burnsville, Minn.
11. Al Schill, Franklin, Wis.
12. Dennis Vogel, Manitowoc, Wis.
13. 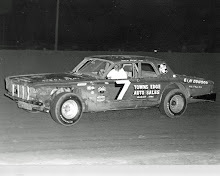 Jim Weber, Roseville, Minn.
14. Greg Guzzo, Addison, Ill.
15. Dave Watson, Milton, Wis.
16. Larry Schuler, New Lenox, Ill.
18. Jim Pierson, Beloit, Wis.
19. Conrad Morgan, Dousman, Wis.
20. Fred Campbell, Battle Creek, Mich.
21. Frank Gawlinski, Lynwood, Ill.
22. Don James, Bloomington, Minn.
23. Bobby Dotter, Chicago, Ill.
24. Fran Prestay, Silver Lakes, Wis.
25. Jim Sauter, Necedah, Wis.
26. Dave Tomczak, Cudahy, Wis.
27. Ed Hoffman, Niles, Ill.
28. John Ziegler, Madison, Wis.